Inspiration and ideas for the artist in all of us. I've been fortunate to have taught high school, middle school, and currently elementary. Moving downwards has had its challenges. I realized at each transition that it takes time to get to know the developmental level of my students. I often get excited about a project, then discover it is way beyond what my students can do. On the other hand, I've also been amazed at what they can produce when encouraged. I've found that most learning activities can be altered to meet the needs of any age group. For example, I love creating color wheels, and work through several samples each year with every age group. More xperienced students are challenged to create a unique wheel where they demostrate advanced levels of color theory knowledge. 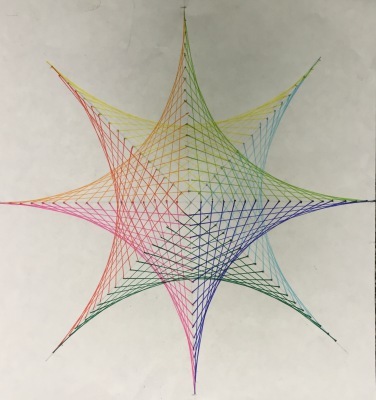 This is the result of a couple failed attempts to gather information about my student's understanding of basic color theory via a summative assessment. I had to reconsider what I actually wanted to know about each student then how I would be able to ascertain whether they had not only mastered the skill and if not, where did their misconceptions arise? 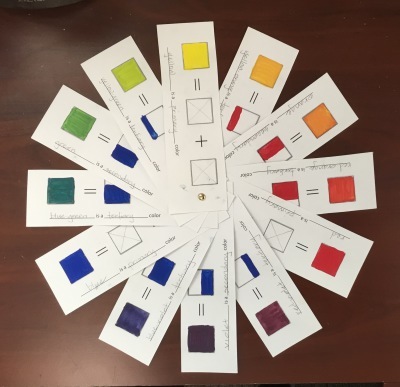 This exercise results in a color wheel tool that students can actually keep and use for reference. I remember how much I enjoyed making parabolic curves and string art as a child. I introduced it to a group of analytical thinking 5th graders who were seeking more challenging work. They took off with the concept and made some spectacular art. This has been placed in my must do lessons. There are several how-to sites as well as videos available. I've created a list of my favorite resources for this project. 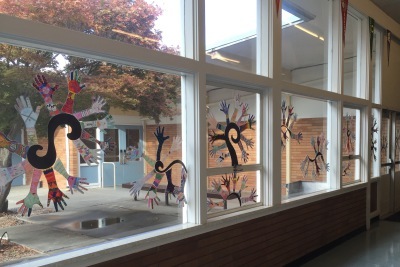 This was my first attempt at a collaborative piece that would include work from every student in the school. 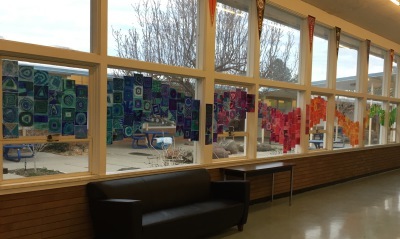 Each student was given a 6 inch square and had to choose 3 analogous colors from the color wheel. 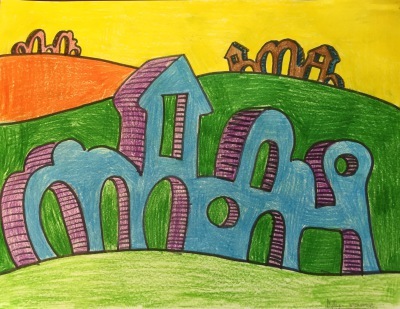 Adults were also encouraged to create a piece. The final effect was a rainbow wave that extended down a large hallway lined with windows. 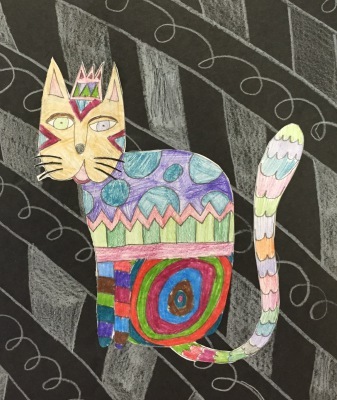 At the beginning of the school year I like to begin with a lesson that allows to me to assess my students' art knowledge/skills and helps me get to know them. In this lesson, students trace their non-dominant hand and forearm, then design it with objects and features that illustrates what is important to them. A variety of media can be used, but I'm partial to colored pencils. I wanted to find a fun way to help my students understand how to create 3-dimensional organic shapes. This lesson also opened up the opportunity to incorporate some art history, make cultural connections and do some cross-curricular work. I was once again astounded by the quality of student work and how much they enjoyed it. It took some modeling and practice, but once the students understood the concept, there was no stopping the creativity. This is from one of my favorite resources, "From Ordinary to Extraordinary: Art and Design Problem Solving" by Ken Vieth (2000). Although the lessons are designed for older students, I've used the concepts to develop simpler plans for younger grades. There are always students who develop their skills at a faster rate and desire to do more.